Are you trying to install QuickTime for Windows 10, but halted by a message telling the prevention of the installation of QuickTime for Windows 10? Since Apple had announced that it won't offer updates for QuickTime player on Windows, you can notice that Apple only list Windows Vista and Windows 7 in the QuickTime download page, and you are no longer able to install QuickTime v7.7.9 on Windows 10. How to install QuickTime player for Windows 10? Here is the guide. 5KPlayer, the best free QuickTime alternative for Windows 10, is your best choice to play any HD 1080p AVI MKV WMV MP3 AAC etc files on Windows 10/8/7/Vista as well as Mac OS without hassle. 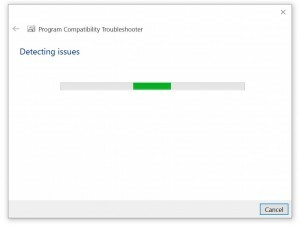 It will strengthen itself all the time to be comaptible with the latest Windows OS and Mac OS that will avoid you from cannot install QuickTime Windows 10/Mac - error 2894 problem. QuickTime, an extensible multimedia framework developed by Apple Inc., is capable of handling various digital videos, pictures, sounds, panoramic images, and interactivity. As QuickTime 7 for Windows 10 is not available now, you may need to uninstall QuickTime to keep your Windows PC secure from the potential danger caused by the stopped update. However, once you do that, your Windows 10 PC won't play the HD movie trailers that Apple streams online, video clips recorded on Apple devices and various other videos that are broadcast over the internet. How to install QuickTime Windows 10 safely if you want to keep QuickTime on your PC? Here are the workarounds. If you want to install the latest QuickTime v7.7.9 for Windows 10, you will see an alert message showing "QuickTime 7 requires that your computer is running Windows Vista or Windows 7". Under the circumstance, you can try QuickTime 7.6 for Windows 10 instead. Open the folder, right-click the QuickTimeInstaller.exe and choose "Extract here". If you can't extract the installation file, you can download and install WinRAR or 7Zip to have a try. Now, you should have a folder that looks something like this, under C:\QT or whichever folder you create. *Double-click the AppleSoftsUpdate.msi file and click "OK", "I accept" etc until the install finishes. *Do the same with ApplicationSupport.msi. *Just ignore the file called QuickTimeInstallerAdmin.exe as we won't need it. Right-click the QuickTime.msi file inside the folder you extracted the QuickTimeInstaller.exe file to earlier. b. Wait for the wizard to scan the QuickTime.msi file for possible culprits (which we already know to be the Windows version check). c. It should say that it has applied a "Skip Version Check" workaround to enable the QuickTime.msi installer to run. d. Click "Test the program" and run the installation. Then click "Next" and finish the installation. e. If it worked without error, you're now done! If not, or if all else fails, continue to refer to point 6 to point 10. Download this TRANSFORM file and extract it to the same folder. We will use this file to temporarily remove the OS checks preventing the installation. Click the Windows icon or Search icon and search CMD. 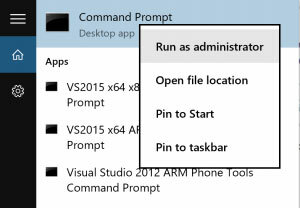 Right-click the Command Prompt shortcut/icon and choose Run as administrator. Installation shouldn't take more than a couple of minutes. Note: A log file called install.log will be created in the C:\QT folder, which should end with something along the lines of "Return code 0". If not, and QuickTime wasn't installed, you may look in this file for any possible error codes (opens fine in Notepad or WordPad). Alternatively, you will need to download and install the older version QuickTime v7.7.6. Obviously, it is quite complicated that installing QuickTime player v7.7.9 on Windows 10. To make it easier, you can try QuickTime alternative Windows 10 player 5KPlayer to play any 8K 4K HD 1080p 720p AVI SWF MKV DivX MPEG MP3 AAC etc video music smoothly. It is comprehensive that it is a QuickTime alternative for Windows 10/8/7 as well as media player for macOS Sierra/Mac OS X. This QuickTime alternative Windows 10 player is also a considerate helper to solve QuickTime not playing MP4 problem effectively. Bonus: 5KPlayer is an all-in-one software integrating with video music playback, online video download and video audio AirPlay that you can download hot songs, latest movies, Olympic games, TV shows, etc to watch offline and stream them to HDTV to have a better viewing and listening experience. 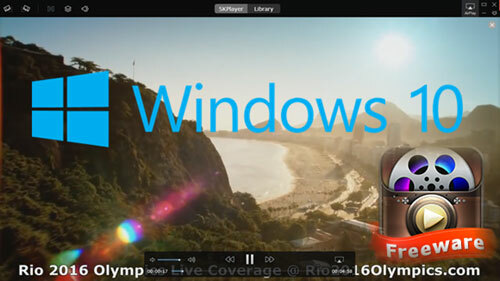 Get the latest version of Total Video Player for Windows 10/8/7/Vista etc to play MP4, H264, MOV, FLV, DAT, MPEG, etc.